Siliphos is the amazing ingredient which allows this cartridge to protect your hot water heater from the deleterious effects of corrosion and hardness. It sequesters the hardness ions thus inhibiting them from precipitating out of the water to create scale. Scale can decrease your hot water efficiency by 30 - 40%. Also the siliphos reacts with the hardness carbonate to secrete a thin glass-like coating on the interior metal surfaces thus protecting from corrosion. Will trap dirt / sediment down to 5 microns. 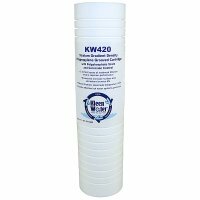 The KW420 is an ideal cartridge to filter water supplying tank-less hot water systems. These units drastically lose efficiency and functionality when calcium and magnesium cations precipitate during the heating process. 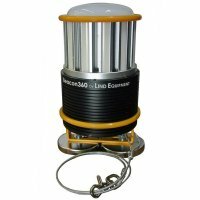 The KW420 is ideal for traditional hot water tanks and tank-less systems. ~ Made from FDA (CFR 21) Compliant Materials.